The Holstein saga begins in Massachusetts in 1852 when Winthrop W. Chenery bought a single black pied ‘Holland’ cow off a Dutch ship. Several years later, in 1857 and 1859, Chenery imported more black pied cattle from the Netherlands — BUT — these animals introduced pleuropneumonia to his herd and all of them were destroyed (except for one bull named ‘Dutchman 37’ ). Two years after that, healthy new black pied cattle arrived again from the Netherlands. Four new cows and one new bull joined Chenery’s ‘Dutchman 37’ and it was then, in 1861, that the first herd of Dutch black pied cattle in North America was officially established. This initial herd became famous for its milk productivity. So Chenery and other breeders imported even more Dutch black pied cattle (and also some black pied cattle from the German region of Schleswig-Holstein). It is very important to remember that, at this point in history, there was no consistency standard or herdbook for any black pied cattle anywhere — not even in the Netherlands or in Germany. Sometime around the year 1862, Chenery wrote an article about his ‘Dutch’ cattle for the newly-founded US Department of Agriculture and — for reasons unknown — the name ‘Holstein’ was highlighted in his article. It was ten years later though, in 1872, that the first herdbook using the name ‘Holstein’ was published in Massachusetts. But this first herdbook had no detailed color standard or consistency yet expected of this new American breed called ‘Holstein’. Then, in 1877 (five years after the initial ‘Holstein’ herdbook), another gentleman named Thomas E. Whiting also began importing black pied cattle directly from the Netherlands. But, he registered them as ‘Dutch-Friesian’ cattle in a completely new and different herdbook. Now, three years after that, starting in 1880, the Dutch began complaining about all the US breeders that were using the name ‘Holstein’ for their Dutch imports. Why? Because Holstein is not a province in the Netherlands. However, the name ‘Holstein’ remained — not due to malice — mainly because the American ‘Holstein’ breed was not expanding much. American ‘Holstein’ milk quality was in question and sometimes called (as a slur) ‘blue milk’. Additionally, their reputation as a beef breed was unremarkable. Keep in mind that, at this point in its history, the American ‘Holstein’ breed was still being raised as a dual-purpose dairy/beef animal. Anyway, in 1881, a year after the Dutch complaints started piling up, a Canadian gentleman named Michael Cook (and his son) imported some American ‘Holstein’ cattle to his farm in Aultsville, Ontario. Then, in 1882, surprising the American breeders, Friesland (which is a province of the Netherlands) exported over a thousand pre-registered black pied cattle to the US. Cattle were finally being registered in the Netherlands before export because registration brought the Dutch a higher price. To confuse things further, only the Canadian breeders eventually adopted the name ‘Dutch-Friesian’ for their Dutch imports. Six more years went by and, in 1888, the American ‘Holstein’ and the Canadian ‘Dutch-Friesian’ herdbooks were joined. In addition, American and Canadian breeders together decided that, from that point on, they would use only the name ‘Holstein-Friesian’ for their black pied breed. However, this event obviously still wasn’t the end of the naming business. • 1925 - Canada established breeding standards which America also decided to adopt. • 1926–1960 - Canadian and American breeders selectively bred their ‘Holstein-Friesian’ to be a single-purpose dairy animal that provided the highest capacity for milk production ever known. • 1960’s - Europe began importing Canadian and American ‘Holstein-Friesians’ to either start or improve their dairy herds, or to transform their dual-purpose herds into single-purpose high-producing dairy herds. • Finally, by 1983 — to avoid confusion with the European born-and-bred Holstein-Friesians — Canada and the US officially dropped ‘-Friesian’ from their breed name and formally began to use just the name ‘Holstein’. So, the Holstein you hear about now, which finally got a name for itself that everyone could agree on in 1983, is today a single-purpose high-producing dairy breed. 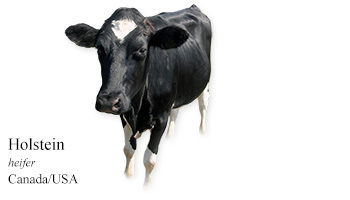 And it is this breed — the Holstein (originating from the US and Canada) — that is, and has been, regularly used and imported worldwide to achieve high milk productivity. My Daily Cow® Canada and USA read about other Canadian and American cattle breeds.